Bowling Green, KY – Kyle Lobstein made a strong bid for back-to-back victories on Saturday night, hurling six shutout innings against the Lansing Lugnuts. Despite his strong start, the Lugnuts rallied for four runs in the eighth inning against Deivis Mavarez to grab a come-from-behind 4-3 victory. The win gives the Lugnuts the series victory with one more game to come on Sunday afternoon. Lobstein’s solid effort was given early run support in the bottom of the first inning, thanks to the bat of Ryan Wiegand. With runners at first and second, the Hot Rods first baseman stroked a double to right field, scoring Chris Murrill to give the Hot Rods a 1-0 lead. It was nearly 2-0 but Tyler Bortnick was thrown out at home plate on the play. By driving in Murrill, Wiegand has now gone two straight games with a first inning RBI double as he pulled off the feat on Friday night. Two batters later he scored on a Dustin Biell single to give Bowling Green a 2-0 first inning lead. Neither team had much going through the next four innings as Lobstein continued to dominate the Lugnuts. He was matched pitch-for-pitch by Lansing starter Ryan Shopshire, who settled down after the first inning to throw goose eggs on the board through the end of five. In the sixth, Lobstein allowed a one-out walk to Ryan Goins, but eventually worked out of that jam to complete his night. He threw six innings for the first time this season, allowing just two hits. He struck out five and walked three and allowed just one base runner to reach second base. He was given another run in the bottom of the sixth as Mark Thomas, catching for the first time since coming off the DL, singled to center field with one out. Thomas stole second in front of a fly out off the bat of Biell. That’s when Brett Nommensen, activated from the DL before the game, singled to center field to give Bowling Green a 3-0 lead. After a scoreless seventh from Jairo De La Rosa, it looked like Lobstein was just counting down the outs until he earned his second victory. Unfortunately, the Lugnuts had other plans. 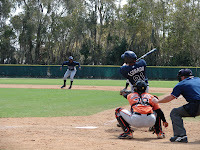 In the eighth, facing Deivis Mavarez, Kenny Wilson reached on an infield single. He was advanced to third base when Ryan Goins singled to right and Ryan Schimpf walked to load the bases. With still no one out, Mark Sobolewski advanced to the plate and doubled into the left field corner, scoring all three runners to tie the game at 3-3. Lansing wasn’t done as the next batter, Brad Glenn, grounded out to advance pinch runner Oliver Dominguez over to third. The pinch runner trotted home moments later when Sean Ochinko grounded out to shortstop to give Lansing a 4-3 lead. The Lugnuts’ bullpen held up their end of the bargain the rest of the way as Matt Wright worked two scoreless frames, earning the win. He turned it over to Steve Turnbull for a 1-2-3 ninth and Turnbull’s second save of the series. The Hot Rods will try to avoid the sweep on Sunday afternoon as RHP Alexander Colome (1-2, 2.27) takes the ball against Lansing RHP Dave Sever (1-1, 3.50). First pitch is at 2:05 PM. The first 1,000 kids 12 & under will receive a Hot Rods Jersey T-Shirt. Gates open at 12:30 PM for season ticket holders and 1 PM for the general public. After the game, kids 14 & under can run the bases like the Hot Rods in the Smucker’s Uncrustables Fun Run. For tickets, visit www.bghotrods.com or call 270.901.2121. You can follow the game with Tom Gauthier and Hank Fuerst beginning at 1:50 PM on 1340 AM WBGN and www.bghotrods.com. Getting Bortnick thrown out at home with no outs in the first inning was a little foolish. The middle of the order coming up?? Still no power. One 2B. When will Cody Rogers be available? Maybe give Glaesmann a try at this level. Then send him or Morrison back to Hudson Valley. Who ever performs better, keep in BG. Cohen had 9 K's in 16AB, so even though he had 5 hits, he probably isn't the answer. I agree with the other Anonymous' comments. Also, can't help but think that it's time to send Morrison back to HV and try someone else in the outfield. Then if he does a great job at HV, promote him to BG. Hearing more and more from Hot Rods fans about the team's stuggles. Understandable, 3 games out of 7th place already, 15.5 out of first. On top of last year (last one half, next to last the other half) it has to be getting frustrating. But I really don't think the Rays will change their plans for a particular players development schedule based on helping the the Hot Rods. If they came in to the year with a plan that player X was going to spend the season at Hudson Valley, I don't think they'll change that because the Hot Rods have gotten off to a bad start. Bottom line: who the Rays might consider bumping to BG and whether they would be an improvement over what's already there are unknowns. And still no word on who will replace Dyer in the rotation. I doubt if there are any players in XST that would make a significant difference in the overall record of the Hot Rods. Players like Rogers, Malm, Glaesman, and Bailey have talent but will probably benefit from another year of short season ball. With the player draft 3 weeks away it will be interesting to see who the Rays select. You would think they would go heavy on position players because they are already rich with pitching talent, but who knows. Per a tweet from Michael Compton of the Daily News, it looks like Aaron Dott will replace Shane Dyer. Happy for Dott! I'm trying to think who played in Hudson Valley and wasn't promoted...Burt Reynolds- 3rd base, Elias Otero- 2nd base, Bennett Davis -infield, Gabe Cohen-outfield, Pitchers-Hunter Hill, Devin Fuller, Kevin Chavez, Kyle Ayers, Aaron Dott....Several players were released. Closer Zach Quate skipped over BG. Uh-oh- you might be right, Diamondtom- it does like Bowling Green is going to have a long year with not much chance of a lot of help coming their way. Gabe Cohen was with BG briefly while Brett Nommensen was hurt, and Kevin Chavez is with Charlotte currently because of an injury, I believe. Yeah, Kevin, I read that, too. I'm sure they were both thrilled to get the chance to "escape" Extended for awhile.